We were pretty impressed with the 2015 Samsung Ativ Book 9 when we went hands-on with it at CES back in January, and now the laptop is at last going on sale. The latest Ativ Book 9 will hit shelves this Sunday, March 1, at two price points: $1,200 (about £780, AU$1,530) for 4GB of memory and 128GB of solid state storage, or $1,400 (about £900, AU$1,800) for 8GB and a 256GB SSD. 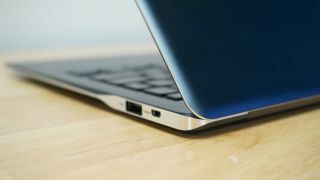 Samsung says the Windows 8.1 laptop is its thinnest yet in the Book 9 line, and its slim, stylish design is certainly one of its selling points. But it also packs a powerful Intel Core M processor, 2560 x 1600 resolution and 12.5 hours of battery life, making it a versatile little 12.2-inch book. Worth the money? That's for you to decide this weekend. We've asked a Samsung spokesperson for the 2015 Ativ Book 9's international release info, and we'll update you here if we hear back.